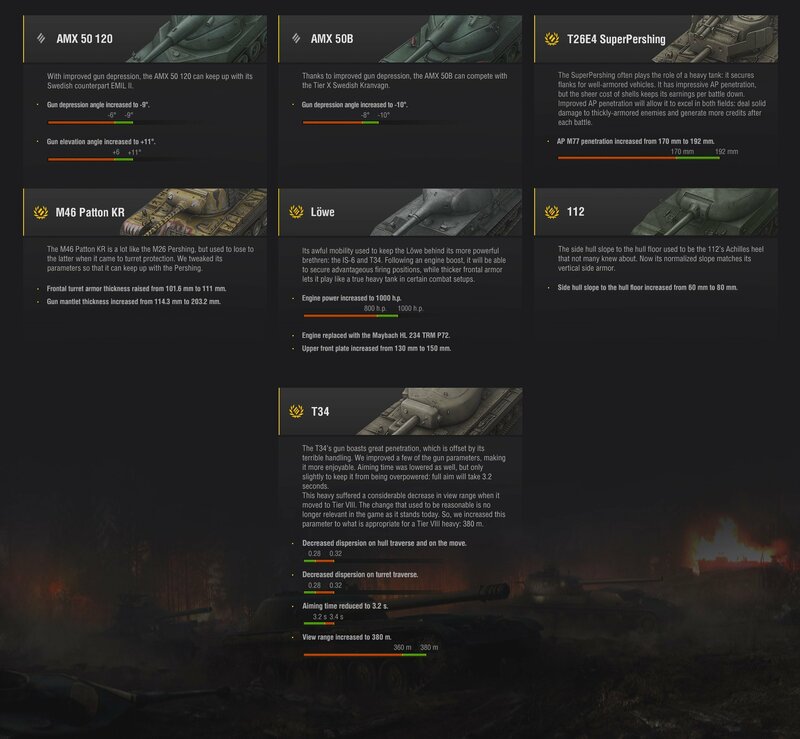 Does tier 8 need rebalanced with the new prems inbound? My main concern is the T26E5 Patriot. Never played the tank but looking at its stats it seems to powercreep almost all of the tier 8s that have 240, 250 alpha damage. It has the best penetration out of all of them & on console has the 3rd highest DPM(57 lower than TVP VTU, 28 lower than STA 2). I know the console version doesn't always want to be like the PC but I was doing a tank comparison on their wiki and the tanks with similar alpha are indeed buffed making the T26E5 Patriot look more balanced amounst it's peers. Caernavon 220 pen 280 alpha RoF 9.23 2584 dpm The UK rebalance looks great. Panther 8,8 203 pen 240 alpha RoF 8.7 2084 dpm Maybe its good now? Edited by Kaboost, 15 January 2018 - 12:31 AM. Jagtiger 8.8 cm and STA-2 have higher dpm. Some heavy tanks (with different alpha) have better penetration, like T34 and Löwe. Just looking at stats, generally the tanks that have similar dpm don't have anywhere near the armor. It also looks fairly mobile for a heavy. Way better than the Caernavon and T32. Add in the standard pen and you have something that's very strong as a package. WG is obviously looking to sell lots of them because they're pretty dummy-proof out of the box. Speaking of the Caernavon I've mentioned it somewhere else but never got an answer. Has anyone heard if we are supposed to get the huge buffs the PC recieved. They did say they're planning on adding the Super Conquer in 2018. They'll probably do it then, hopefully sooner as it's a very meh tank with it's current turret. I'm sure we'll get the re-balanced UK heavy line. The only tank that I think the Patriot creeps is the T32. IMO, the T32 needs its 90mm gun stats improved to match and then we'd be OK.
Good point didn' think about that makes sense thanks. Super Pershing T26E4 must get nerf. 170mm penetration is too dangerous for opponents. 167mm penetration KV-5 is to much. This vechicle must get nerf, immediately..
Caernavon 220 226 pen 280 230 alpha RoF 9.23 2584 dpm The UK rebalance looks great. I think its not different if a tank got 2 cm lower penetration than other tanks. I think the Patriot is OK like he is now! CK Tiger got a realy good gun and DPM. Dont think that Patriot can top this!!! And i think that the Defender is also good as he is. Edited by bux1303, 15 January 2018 - 07:58 AM. The T32 definitely needs to be rebalanced in light of its new better-in-every-way (apart from the turret) premium counterpart. How I would go about doing so is making the T32 more historical. The T32 was intended in real life to use its "stock" gun- I don't think the 105mm was ever proposed.The US military intended to fire new APCR shells out of the 90mm T15E2 as the Pershing's shells were getting long in the tooth (according to the T32 Wikipedia article). In game, the tank is forced to use the 105mm which has terrible pen at Tier 8. I propose making the 90mm the top gun and make its standard ammo APCR. Make the penetration the same as or higher than the Patriot (230-258mm). What doesn't kill you makes you stronger weaker, but what does kill you makes you smarter. Completed Grinds: Type 5 Heavy, Object 140, IS-7, Kranvagn, T62a, WZ-132-1 Grinds in Progress: idk italy? No nerfing we got are tanks ! Don't change them . That is literally why everyone wants a gun buff on the T32. Hell, I don't even own one and I want a buff on it- for balance's sake. I still find that I prefer the captured king tiger to the Patriot... but that's because I love the German gun handling. But the Patriot has good mobility and nice frontal armor. I don't see the Patriot as OP, but it is a solid, above-average premium tank which will be dangerous in a good player's hands. Beware the Banshee Comet! According to Irish folklore, a Banshee is a ghost-like creature that wails (keens) to warn you of your impending death. However on the battlefield, the last screams you hear will be your own! NOTE - I am taking a temporary leave from playing World of Tanks due to certain family obligations. I hope to see many of you back out in battle soon! I'd like the T34 to get a bit of love, slight ROF increase and aim time would be nice. The T32 probably needs a pen buff on the 105. The Super Pershing definitely needs a pen buff on the regular AP. The STA's DPM is ok but the accuracy and shell velocity is very derpy, meaning you miss/bounce a fair few shots even fully aimed. Had received xext nerf to T26E4 & Freedom most popular 8's tier premium tanks.